Don't waste a minute. 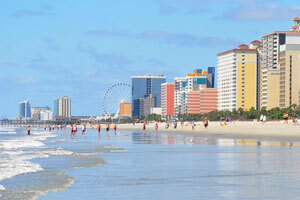 Head off to the beach and dive into warm Myrtle Beach waters. Work on your sun kissed look or hop in the pool and go for a swim. Admire ocean view from your balconies while enjoying your morning coffee. Located right on beautiful Myrtle Beach. Your kids will have a blast in the children's pool and activity center. The beachfront Ocean Park Resort is located on the South End of Myrtle Beach, less than twenty minutes away from all of the fun and excitement that Myrtle Beach has to offer. When it comes to underwater fun, Ocean Park Resort has you covered. The outdoor pool is perfect for games of Marco Polo or hunting for dive sticks. Or take a break from the sunshine and check out the indoor pool. The children’s pool will be a big hit with the kids. After the pool, let the kids participate in the seasonal activities program while you hit the fitness center for a workout. Individually owned and decorated one-bedroom condos are air conditioned and sleep six guests. Piggly Wiggly Grocery Store is a short drive from the resort. Take a family field trip to pick up hot pockets and Ben & Jerry’s to stock your kitchenette. Don’t worry if the kids end up getting ice cream on their clothes; the resort has an on-site laundry facility. Flat screen TVs have cable, and DVD players, perfect for catching the latest episode of This is Us or for family movie night. Have the kids pack a few of their favorite movies to watch. There’s nothing worse than having to leave your four-legged family member behind when you go on vacation. Good news; you don’t have to! Ocean Park Resort is dog-friendly. The resort even has an on-site pet grooming facility, “Furology Paw Spa”, to keep your furry friends clean, healthy and happy. Bring the family along for a ride on the SkyWheel. It’s almost two-hundred feet tall and provides the best views of Myrtle Beach. Climate-controlled gondolas ensure a comfortable ride for the entire family. Little ones will enjoy the Children’s Museum of South Carolina. It features several interactive exhibits where children can play and learn at the same time. They can be a bank teller at The Big Bank, a contractor at Under Construction House or a paleontologist at South Carolina Fossil House. Broadway at the Beach features a variety of shopping and dining. Kids will love Build a Bear, where they can create their own stuffed animal. Treat yourself to a new piece of jewelry at The Mole Hole or Pick a Pearl or a new pair of shades from Sunglass Hut. Surprise your dog with a gift from Reigning Cats & Dogs. Hungry? Dine at Hard Rock Cafe, Johnny Rockets, or Joe’s Crab Shack.